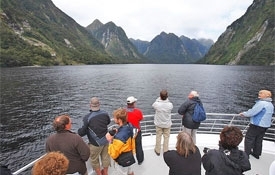 Get up close and personal with Milford Sound on our leisurely Nature Cruise. As you cruise the length of the fiord, learn about the history of the region and benefit from the knowledge of your specialist nature guide. Experience the spray of a waterfall as you cruise close to sheer rock faces or watch out for dolphins, seals and in season, the rare Fiordland Crested Penguins. The Nature Cruises have a flexible, extended itinerary which gives you plenty of time to enjoy the scenery and take in the highlights. 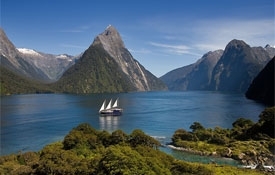 The experienced skippers will tailor the cruise route on the day depending on the weather and wildlife sightings to ensure you get to see the best that Milford Sound has to offer. Immerse yourself in the vast and untouched wilderness of Doubtful Sound, the second largest fiord in Fiordland National Park. With its rugged peaks, verdant rainforest and twisting, hidden inlets, Doubtful Sound will take your breath away. Home to abundant wildlife you may see bottlenose dolphins and fur seals at play, or catch a glimpse of a rare Fiordland Crested Penguin. Getting to Doubtful Sound is an adventure in itself. With no direct road access, the only way you can reach Doubtful Sound is by a cruise across Lake Manapouri and a coach trip over Wilmot Pass. This isolation makes the fiord a very special place, a place only those in the know get to see. Your trip to the Te Anau Glowworm Caves begins with a cruise to the western shores of Lake Te Anau on a purpose-built scenic cruise vessel. At the entry to the caves is Cavern House where you can view the informative displays and learn about this geological wonder before you join your guide underground. On the tour of the caves the friendly guides will point out the highlights and share their knowledge of the caves and their history. This underground world is astonishingly beautiful. By geological standards the caves are very young (12,000 years) and are still being carved out by the force of the river that flows through them. The result is a twisting network of limestone passages filled with sculpted rock, whirlpools and a roaring underground waterfall. 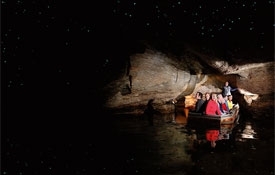 Deep inside the caves, beyond the roar of the water, you will be taken by small boat into a silent hidden grotto inhabited by thousands of glowworms, unique to New Zealand. In the subterranean darkness, they produce a glittering display that is nothing short of extraordinary. 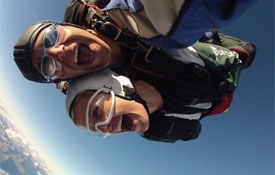 Discover your own natural high while jumping from a plane 15,000ft above New Zealand's most stunning alpine scenery! Freefall at 200kph over Mt Aspiring and Fiordland National Parks, part of the Te Wahipounamu World Heritage Area. 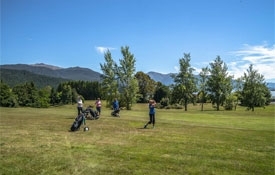 The views from the Te Anau Golf Course take in Lake Te Anau and the surrounding mountains. Golfing here on a sunny day gives you the feeling of being in paradise. Visitors welcome. 18-hole par 72 course. 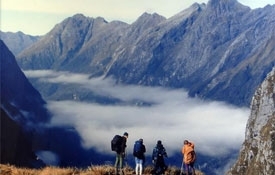 Known to New Zealanders as 'tramping', the endless hiking and walking opportunities within Fiordland National Park can be explored independently or as part of a guided group. Fiordland has an excellent network of walking tracks within the National Park giving this area the reputation as the 'Walking Capital of the World.' Amongst these are the 'Great Walks'; the Milford, Kepler and Routeburn Tracks. Te Anau makes a great start and end point for these trips. Walkers can stock up on provisions, and check the weather and track conditions before leaving. For a peek at some of Fiordland's birds that are difficult to see in the wild, visit the Te Anau Wildlife Centre beside Lake Te Anau. 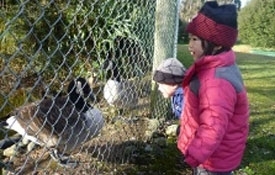 It's a great place for children and families, and an easy 10-minute walk from Te Anau. The Wildlife Centre is open from dawn until dusk and entry is by a gold coin donation. The aviaries and pens that house the birds are set in beautiful grounds with views of the lake. Free flying birds enjoy the trees planted there and the ducks like the water edge below the boardwalk by the lake. Enjoy the beautiful water on a hot day – go for a splash or a swim.